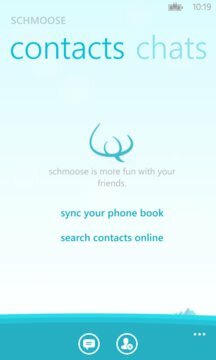 schmoose is a cross platform instant messenger with a passion for privacy. With end-to-end encryption you can exchange messages and media without the cost of using SMS and without the nagging feeling that someone is watching you. Your conversation stays private the way you meant it to be! It’s not just another instant messenger—with schmoose you reclaim your control over who sees your messages. schmoose is continuous communication in privacy. Whether you’re on your way to work, in the office, or going out with friends, schmoose offers you seamless communication on all major platforms and devices. Start up your conversation on the go with your phone, keep it going at your desktop, take it up again from your couch and tablet. schmoose keeps you in sync – unlike most others. 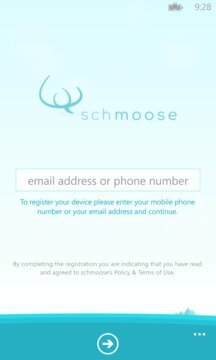 schmoose bundles encryption with convenience. Encryption doesn’t need to be gray and complicated anymore (though encryption software and services usually are). We’ve crafted schmoose into an extremely user friendly messenger app. Enjoy privacy without having to worry about security—we take care of that. It’s a gratifying user experience built on reliable technology. schmoose uses open standard technology for end-to-end encryption (AES-256, SHA-256, RSA with key size of 2048 bits). These technologies guarantee privacy—you’ll feel good again about texting confidentially with your friends and colleagues. With the OpenPGP standard in place, schmoose provides the ready environment for you to conduct truly private communication based on proven technologies. Data is only exchanged using a secure line (128-bit TLS 1.2). No one else can read your schmoose messages, not even us, and that’s the way it should be!